Senior British Members of Parliament ask Egyptian authorities to allow them to visit former Islamist President who is now in prison. Senior British Members of Parliament said Tuesday they asked Egyptian authorities to allow them to visit former Islamist President Mohammed Morsi, deposed and now in prison, over concerns that his health is deteriorating because of poor detention conditions, The Associated Press reported. The bipartisan group, headed by the Conservative Party's Crispin Blunt, made the request a day earlier in a letter to the Egyptian ambassador in London, the report said. They lawmakers they want to review the conditions of Morsi's detention in Egypt's Tora prison along with a lawyer. One of the parliamentarians is a doctor specializing in cases of mistreatment and torture. In a copy of the letter quoted by AP, Blunt says he was asked to make the request on behalf of Morsi's family, who say they have seen him only twice in detention in four years. They say he is suffering from worsening diabetes, high blood pressure, loss of sight in one eye and other ailments, and is not receiving proper treatment. Morsi, Egypt's first democratically elected president and a member of the Muslim Brotherhood, was ousted by the military in July of 2013 following mass protests against his rule. He has been sentenced to decades in prison in several cases, including one alleging he used unauthorized violence, arrest and torture to put down a protest outside the presidential palace, and another based on his leadership position in the now-banned Muslim Brotherhood group. Other cases are still pending. In November of 2016, Egypt's court of cassation overturned a life sentence against the Islamist former President in a case that revolves around accusations of espionage with Hamas. 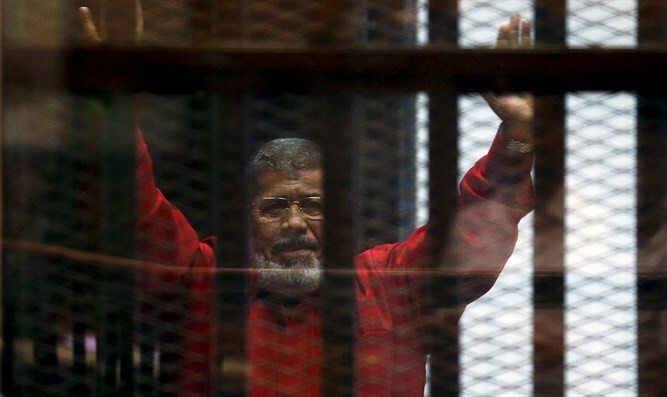 A week earlier the court overturned a death sentence against Morsi in a case in which he and five other leaders of the Muslim Brotherhood were sentenced for their roles in organizing a mass prison break in 2011. Most recently, in December of 2017, the ousted president was sentenced to three years in prison for "insulting the judiciary". Morsi's son Abdullah said Tuesday that Egypt's upcoming election should be a reminder that its first democratically elected president, overthrown by the military in 2013, still languishes in prison "in appalling conditions in breach of international laws." "His request for urgent medical treatment during a trial session was refused," Abdullah said in a statement quoted by AP. "Regardless of any person's opinion of my father or his beliefs, this is unacceptable for anyone. That is why we have asked this independent panel — with legal, medical and foreign policy experience — to assess the situation."